North Idaho College has subscribed to the New York Times online. Access is free for currently-enrolled students, faculty, and staff but registration is required. You must be connected to a campus internet network to register; after registering you can access your New York Times account from anywhere. Digital Subscription on Any Device! You must be connected to the NIC campus internet network for registration. Create a nytimes.com account using your current NIC email address. When you see the Start Your Access screen, the expiration* time and date of your pass will appear. Go to nytimes.com and enjoy access from any location by logging into your account in the upper right corner of the page. *Accounts expire each calendar year, but you will be able to reactivate your account on a yearly basis. What does a Group Pass offer? Public users can access 10 free articles from NYTimes.com per month, but access to additional articles requires a paid subscription. Setting up an account with Group Pass gives you access to all content on the NYTimes.com site. Licensing agreements allow The New York Times group pass users access to up to five free articles published between the years 1923 through 1980 daily. Unlimited access is available for archived articles outside the 1923–1980 date range (e.g., 1851-1922, 1980-present). Can I access The New York Times when I'm not on the NIC college campus? Yes. After your pass is activated on North Idaho College's network, you can log in to the site from anywhere! Can I access The New York Times from my mobile device? Yes! 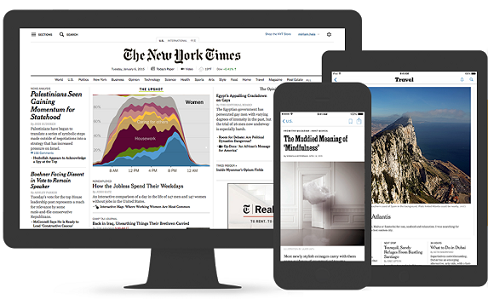 You can access the browser version of NYTimes.com from any device, as well as the NYTimes app for iPhone, Blackberry 10, Windows Phone 7+ and Android-powered phones; and the NYTimes app for iPad, Kindle Fire, Windows 8 desktop and tablet, Android-powered tablets.